A glass of milk and a piece of cookie, well, it's a best time of the day, ^ ^. I got a cold lately (and still >*<, the weather in Thailand is very annoying, rainy and hot, ahh!). 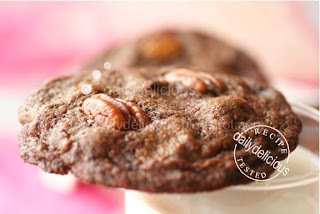 So, when you don't feel well, the best thing is the comfort food, and for me is a piece of chocolate cookies, haha. I really love the pecan nut, but if you're in love with other kinds of nut feel free to change. 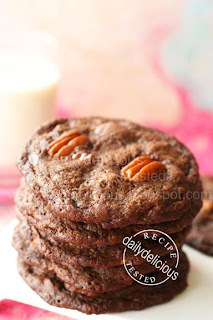 For me, the lightly bitter taste of the pecan nut is the best thing when eating with something sweet. These cookies will be very soft when just coming out of the oven, so don't try to move the cookies, or they will break and fall apart. Let the cookies cool in the sheet pan for a bit of time, it will be harden when cool. 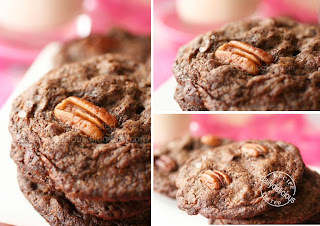 Well, a bittersweet of the chocolate and a touch of pecan, serve with glass of milk, I think I will get well very, very soon. Sift the flour with baking soda and salt, set aside. 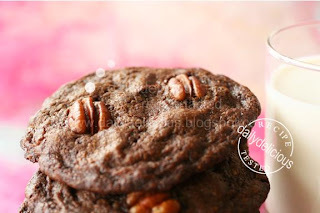 Keep 32 whole pecan nut for decorating the cookies, and lightly chop the rest. Melt 85g of the chocolate in a medium heatproof bowl set over a pan of almost-simmering water, stirring once or twice, until smooth; remove from the heat. Either by hand or with an electric mixer beat the butter at medium speed until smooth and creamy. Beat in the sugars until combined. Reduce the speed to low and gradually beat in the egg, melted chocolate and vanilla extract until incorporated. With the mixer at low speed, add the dry ingredients and mix until just combined. Do not overbeat. Scoop the dough onto the prepared baking sheets with a 1½ -inch ice cream scoop, spacing the mounds of dough about 1½ inches apart. 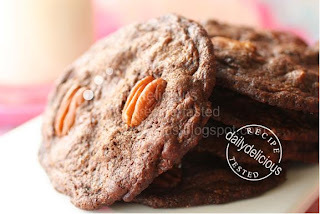 Top the cookies with the whole pecan. Bake until the edges of the cookies have just begun to set but the centers are still very soft, about 12 minutes, rotating the baking sheets front to back and top to bottom halfway through the baking time. Cool the cookies on the sheets about 10 minutes, slide the parchment with cookies onto wire racks, and cool to room temperature. Remove cooled cookies from the parchment with a wide metal spatula.